I was pretty disappointed when Toby’s Public House closed. It was a true neighborhood favorite, with good pizza and friendly staff. Then I heard a rumor that a new place had opened up in the old Toby’s space, a place called Battle Hill tavern. We stopped by on a recent summer night and I’m happy to say that it lives up to the Toby’s legacy. The menu, in fact, is pretty close to Toby’s. We shared a salad, which was great, and then I had the Spinaci pizza. 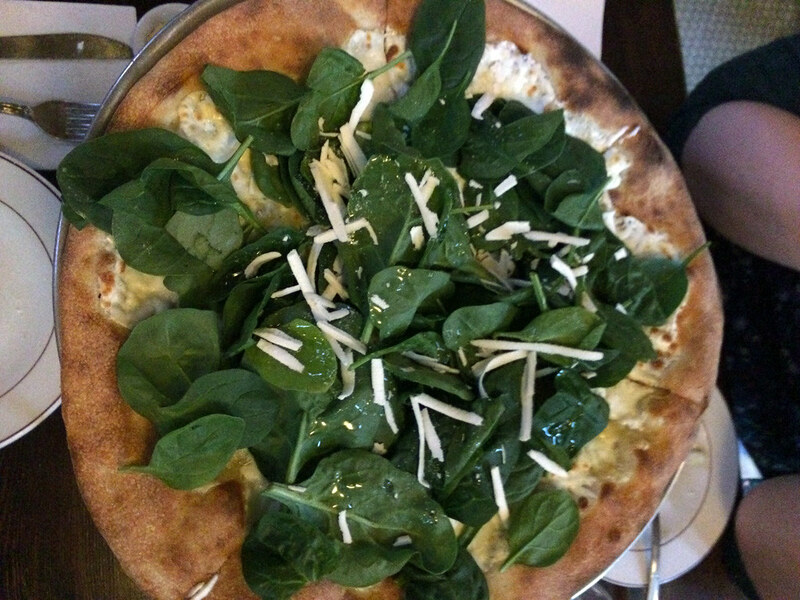 The Spinaci is a white pie topped with fresh spinach and truffle oil, and it was my go-to order at Toby’s. The crust, while not as puffy as a Neapolitan-style crust, was thin, crisp, and tasty, and the balance of toppings was spot on. Carolyn got the Funghi, another white pie but topped with mushrooms and onions, and it was also delicious. I’m happy that the neighborhood has high-quality pizza again, and I’m looking forward to a return visit. This entry was posted in greenwood and tagged battle hill tavern, greenwood, pizza, toby's. Bookmark the permalink.